Feet First: Willow Glen High School senior and cross country runner Marcos Corona (second from left) is ranked third in the state. He has been juggling school and his family business since his mother became ill.
For Willow Glen High School senior Marcos Corona, the finish line on the track means more than just the end of a race. It's also a new beginning. Getting there was all about balancing two worlds--one that runs deep in the southern mountains of Mexico and the other that leads him to the Rocky Mountains of Colorado. The climb has been a long and grueling one. "My older sister and I are the only two who speak English," Marcos says. "It's like living in two worlds." Marcos immigrated to the United States with his older sister Maria Yaneth Guzman, younger brother Luis Balles and aunt Carmen Ramos when he was 4 years old, to be with his mother, Maria Pacheco. The senior, who is ranked third in the state in cross country, knows what tough is as his family struggles to make ends meet, living from paycheck to paycheck. Then a single mother of three, she needed to support her family. Pacheco in the middle of her naturalization process, she had limited employment options. Pacheco could only do one thing while she waited--clean houses. "It was the only kind of work she could do," Marcos says, "and she grew to love it." After a few years, Pacheco and her sister, Ramos, started their own cleaning service. Marcos and Guzman helped the business by creating business cards for their mother and assisting her with the initial job interviews for customers. But the family's financial difficulties did not subside. They had to move frequently in order to find more homes to clean, and they never developed a steady flow of customers. The family returned to San Jose in 2002. Marcos began helping his family by working Friday nights and Saturdays with his mother, cleaning office buildings. Only if he was able to finished early enough did he run. Then Marcos' dreams of getting a scholarship and attending college were put on hold when his mother became ill and began experiencing debilitating headaches and nausea. The doctor told Pacheco she had high blood pressure, but was unable to diagnose the cause of her headaches and nausea. Pacheco was out of work for two weeks, and her husband stayed home from work to take care of her. The youngsters started missing school in order to keep the family business afloat. Marcos says this was his only choice. If he and his siblings did not fill in for their mother, she would have lost her customers. "We are always worried about money," he says, "worrying about whether we are going to have enough to eat, enough to pay rent every month." As a result, his grades began to suffer, which in turn could limit his track time and his chance at an athletic scholarship. 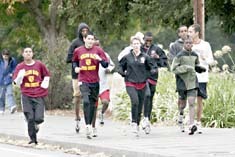 "It's a critical time right now," says Willow Glen High School track and cross-country coach Victor Santamaria. "It's application time. He can't afford to miss school." Marcos transferred into the high school his freshman year. He began in October and was placed in English as a Second Language classes for his first two years. His schedule of classes included world geography with teacher and coach Santamaria. "By the first practice it was obvious that he had a natural gift for running," Santamaria says. Marcos, however, had difficulty understanding how academics and athletics were intertwined. For the most part, Marcos' academic life had been unstable because his family moved frequently. "He lacked consistent academic success, and it hurt his confidence levels," Santamaria says. The coach showed Marcos that running can be a vehicle for academic success. With the delivery of his first college informational letter and invitations to tour campuses, Marcos began to see the connection. "It's a fine balance to maintain his commitments at home without ignoring the opportunities at hand," he says. Marcos practices five days a week, two hours per day, and tries to squeeze another couple of hours of practice time in on Saturdays. His dedication has paid off. He finished second in the Central Coast Section Division III his sophomore and junior year, and continued that streak into his senior year. Marcos' efforts on and off the track have now caught the attention of one college in particular--Princeton University. "Coaches and universities know who he is," Santamaria says. "Something extraordinary is happening to him." The Princeton letter was only one of a slew of letters Marcos received his sophomore year. "He's filled with excitement," Santamaria says. "He's receiving real offers from schools who believe in him and are claiming he is the best in the nation." Yet staying balanced among home, school and the track remains a challenge that won't go away, Santamaria says. "He will always have to help out at home. He just has to get through it and stay focused," he says. "He can't give up. He's never gave up on a race, and his strength in running is his strong finishes." The finish line is starting to look better by the minute, because after many long afternoons and nights Marcos has caught up. "He really overcame that hill," Santamaria says. "He's a very capable individual. He's an immigrant student who became an honor roll student and a team leader." Although the dip in his grades cut his chances at Princeton to a sliver, he's filling out his college applications unfazed and hopes to get accepted to the University of Colorado. "I could help my family a lot if I go to college," Marcos says. "I could get a scholarship so I can go, and I don't have to pay for my tuition." Along with joining the university's well-known track and cross-country teams, Marcos wants to become an architect. That would help him accomplish a goal that has been part of his family's American Dream. "My mother's one dream in life is to own a house," he says, "and with my education, I hope I can make money to make her dream happen."